Many BMW boxer hours have been logged here at the bivouac but the 2019 BMW R1250 Adventure looks to represent a serious step forward in development and refinement. Even coming from the world of the superlative K1600GT, the new telematics and interface options for 2019 seem leaps and bounds ahead. 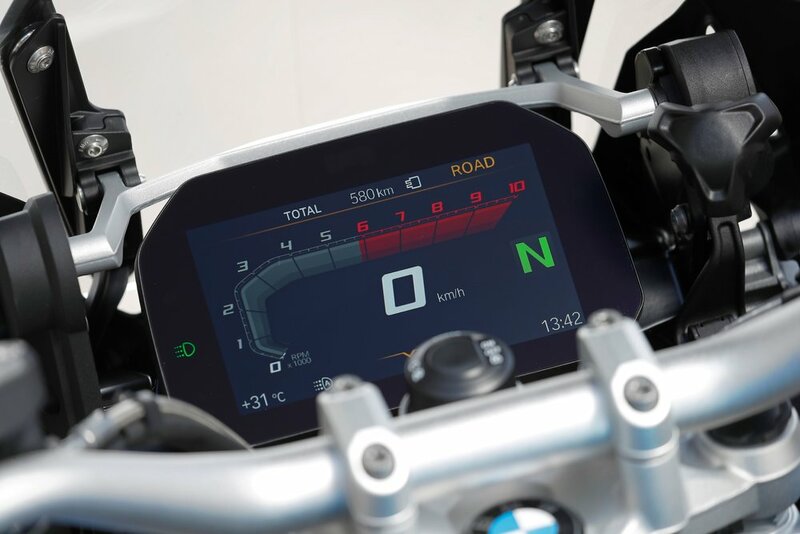 With a crisp and bold Thin-Film-Transistor (or TFT) display, BMW has upped both the functionality and legibility of their displays and they are making them standard across many more models this year. With robust integration of phone features including playing audio and providing turn-by-turn navigation prompting plus a slew of adjustability and informational displays about any given bike setting, this seems like a must have feature that quite a bit of design effort and development has gone into. Significant Redesign: The 2019 GSA has a redesigned boxer engine with shift cam technology and a revised powerful TFT display. Heads Up: The TFT display has been designed for easy access to information and glanceability and configuration. Clearly Ahead: The display technology works across a variety of lighting contexts. Building on the Past: A fond view at the bivouac, the K1600GT’s configurable display is still solid but is starting to age. In its initial instantiation, the clocks always had legibility issues which were addressed to some degree with a refresh. Any such issues on the GS line have been clearly solved with the new the R1250GSA instrumentation.